Do you want to wait until you're out in the field to find out how much a paintball hurts? No? Didn't think so! Those puppies can travel at 300 feet per second. That's over 200 miles per hour! Welts are a badge of honor for the avid paintballer, but you can reduce pain and avoid injury with the right paintball gear. What does that entail? Let's go through it, head to toes. Let's start with the second least fun place to take a paintball: the old noggin. Goggles and mask are absolute, 100%, no contest essential. Don't even show up to the field without them, unless you know you can get them on hire. You'll need to outfit yourself specifically with paintball goggles. Goggles from a regular store won't do the job at the speeds we mentioned, and won't include a mask to protect your face. Go for thermal lenses if you're worried about them fogging up. Even better, get a goggle fan to go with them, but make sure the two are compatible first. A full helmet is also an option, but a lot of players find they suffer from fogging and overheating issues with the head enclosed, so it's a case of personal preference. Hats are optional, but a good idea if you want to protect the rest of your head. Luckily, your skull can do most of the job here, but layering up with a hat or beanie can save you some unsightly welts and the trial of washing paint from your hair. Don't forget your neck, either! Cover exposed skin here with a dedicated neck protector, turtleneck, or even a bandana. Anything to provide a buffer between the paintball and your delicate skin. With your head safe, it's time to think about the rest of your paintball gear. The good news is that a lot of your old clothes can serve just fine for paintball gear! When it comes to colors, try to go for dark, muted colors to help you blend into the environment. Protection is as important here as it was for your head. An avid paintballer is always going to end up with a few welts, but you may as well do your best to minimize them. Check the weather, and then dress as heavily as the weather allows. Be careful to keep your freedom of movement. Long, loose clothing is ideal. Don't leave skin exposed. That's asking for a welt. Wear an old, long-sleeved shirt. And then another one over that. If weather permits, wear something even thicker over that, like a sweatshirt or hoody. Specialized paintball jerseys are available for the avid player or those looking to splash out. They're reinforced, so you might even swap out a layer for one. All of this layering has a tactical advantage, too! 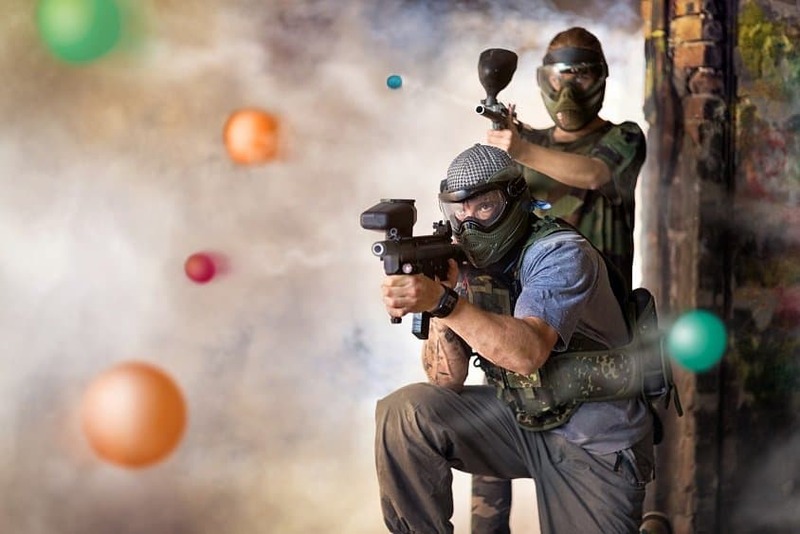 Paintballs are less likely to break if the impact is absorbed, meaning you can stay in the game that much longer. As with the top half, utility is the order of the day. You have a few options here, whether you layer up on thinner, flexible pants like sweatpants or something more robust like cargo pants. Remember that you'll be running, jumping, sliding, and diving. Wear what you know you'll be comfortable in. Don't even try to wear skinny jeans. Some baggy old work pants are ideal. These will be durable, flexible, and likely to survive whatever you throw at them. As with shirts, there are dedicated paintball pants available. They're often padded in key areas but made of comfortable, flexible material, so they're a logical next step for the enthusiast. While we're in this, ahem, region, now is a good time to consider if you want to wear a cup. Groin strikes are rare, but you'll know all about them when they happen. A bit of prevention here could save you a lot of agonies. With the rest of your body armored up, you'd be stupid to forget your hands. Moreso than other parts of your body, the lack of flesh on your hands means a paintball strike will cause massive amounts of pain. Again, you're looking for paintball specific gloves here. The only substitutes are those designed to protect the hands in a similar way, like football or work gloves. If you do improvise, make sure the gloves aren't too thick. You need to pull the trigger comfortably. Skip fingerless gloves unless you want to experience some serious pain. Imagine the impact of a paintball on an exposed finger in cold conditions. Yeah, now you're with us. Don't wear your best fashionable sneakers to a paintball game. Paint, dirt, and water are all going to mess them up. Whatever you wear should be durable and high-quality. You need good support to protect your ankles from the physical activity involved. Footwear styles range based on personal preference. Some players prefer supportive sneakers, while others opt for military boots. Players will all agree on one thing: never wear open-toed shoes! As you develop a taste for the game, you may want to invest in more specialized options. BDUs and ACUs (Battle Dress Uniform/Army Combat Uniform) offer durability, camouflage, and pockets for equipment. They're also great for dressing to a theme. Specialized suits like ghillie suits and sniper suits offer additional camouflage options. Tactical vests and pod packs are great for extra carry capacity. These items all come with loads of variations for various environments, so you'll be able to adapt your paintball gear to suit your regular stomping ground. That's the basics covered, but check out our other articles for advice, tips, and tricks about making your paintballing experience the best it can be!